SKU: N/A. Categories: Lotions & Potions, Lubricant. Tags: chill, Heat, lube, lubricant, Wicked. 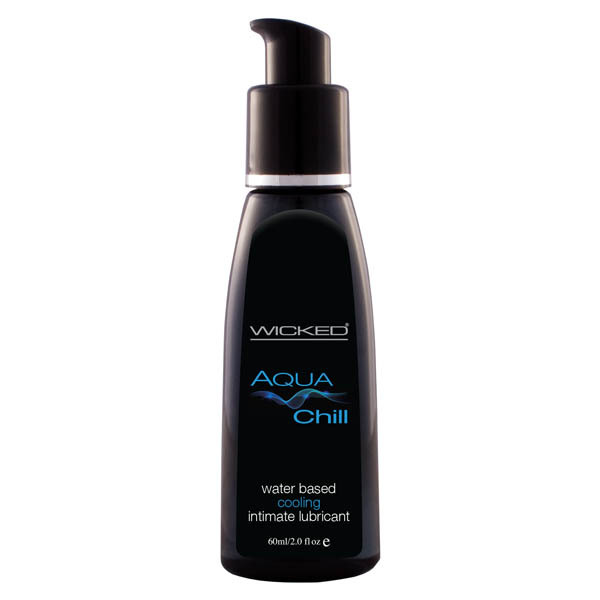 Wicked AQUA products are like nothing you have ever felt before. Waterbased and Paraben Free, the entire collection is so silky smooth you will be surprised that it is not silicone. Made from the finest ingredients for superior performance, each product has been designed to be amazingly slick, extra long lasting and never sticky or tacky. Clean-up is easy with any of the Wicked® Aqua products, simply rinse with water and nothing is left behind except your afterglow. Aqua Heat lets you play with fire and not get burned. A unique blend of warming elements thrill your erogenous zones with pleasure while the advanced water-based formula helps enhance personal moisture. Let the fire build as waves of warmth stimulate & excite. Gentle for all skin types and safe for use with all toys. Try this highly arousing lube with a partner or alone. Aqua Chill lets you experience the ultimate in slippery, shivery sensation. This superior quality water-based lubricant is designed to keep you cool as playtime gets hot. Natural peppermint leaf, ginger root and menthol combine to tingle and excite pleasure zones. Chilling, thrilling and satisfying! To Use: Apply to area(s) where lubrication and sensation is desired. Rinses away easily with water. Cautions: If irritation or discomfort occurs, discontinue use and consult a physician. This product is not intended for use as a contraceptive. Avoid contact with eyes. Keep out of reach of children.